This tutorial will cover Fixed Constraints and Fix Together Constraints to illustrate common constraints you can expect to use. The Fixed Constraint holds all of the parts in the Move Parts list in their current location and orientation. Any moves that list one of the parts as the "object" will force the "target" part to move instead. 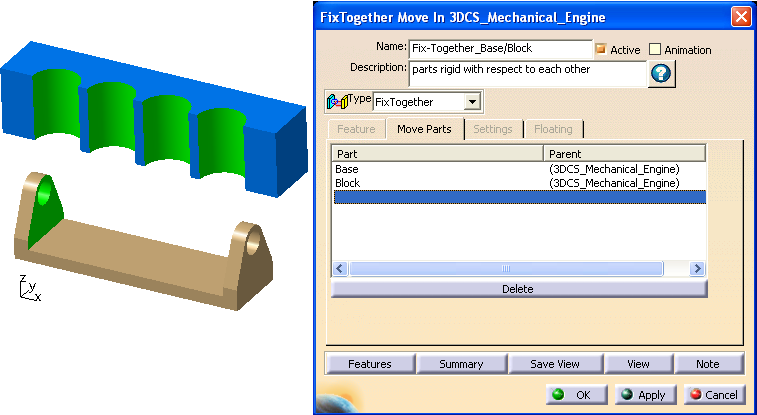 The Fix Together Constraint holds all of the parts in the Move Parts list perfectly rigid relative to one another. If one of the parts is moved then the other parts will move with it. Additional constraints include Coincidence, Contact, Offset, and Angle. Create a Fixed Constraint for the Base part. Ensure no part is currently selected. 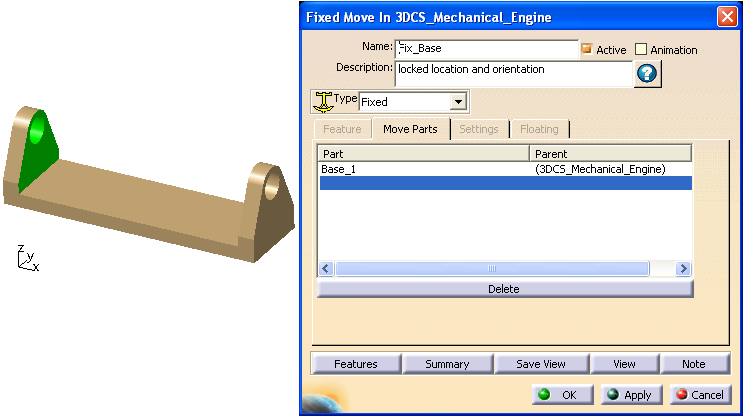 On the DCS Mechanical toolbar, expand the Constraints toolbar and select Fixed Constraint. Select the top product, 3DCS_Mechanical_Engine, in the Navigation Tree. Name the move "Fix_Base" and give it a Description of "locked location and orientation". 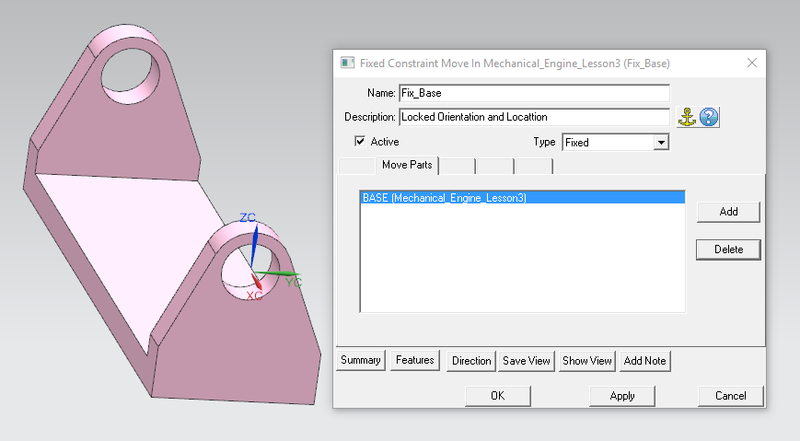 Select the Base part in the graphics window for Part under the Move Parts tab. Click [OK] to create the move. Create a Fix Together Constraint for the Base and Block parts. On the DCS Mechanical toolbar, expand the Constraints toolbar and select Fix Together Constraint. Name the move "Base_Block_FixTogether" and give it a Description of "parts rigid with respect to each other". Select the Base and the Block parts in the graphics window. They will be listed as Parts under the Move Parts tab. Select the Share Menu button in the top right corner and select [Save]. Or expand the save menu and select [Save with Options] and name the file "3DCS_Mech_Engine_Lesson3". Constraints are moves. They are routines that define a parts location and/or orientation in space or relative to other parts. Common constraints, as illustrated in this tutorial, include fixing a part's location in space or in relation to another part.